The RIVET software consists of two separate but closely related executables: rivet_console, a command-line program, and rivet_GUI, a GUI application. rivet_console is the computational engine of RIVET; it implements the computation pipeline described in the previous section. rivet_GUI is responsible for RIVET’s visualizations. Given an MI file of a bipersistence module \(M\) and a second file, the line file, specifying a list of lines, rivet_console prints the barcodes of the 1-D slices of each line to the console. The computations are performed using fast queries of the augmented arrangment of \(M\). Given a raw data file as input, rivet_console can print The Hilbert function and Bigraded Betti numbers of a persistent homology module of the input data. It can also print a minimal presentation of the module. The help file also describes some additional technical functionality of rivet_console that we will not discuss here. <output> is the name of the module invariants file to be computed. [-x <xbins>] and [-y <ybins>] specifies the dimension of a grid used for coarsening. The grid spacing is taken to be uniform in each dimension. A value of 0 means no coarsening is done at all in that coordinate direction. This is the default. However, to control the size of the augmented arrangment, most computations of a MIF should use some coarsening of the module. Other (technical) command line options for computation of a MI file are given in the rivet_console help. <line_file> is a file specifying a list of affine lines in \(\mathbb R^2\) with non-negative slope. Each line is specified by its angle and offset parameters. 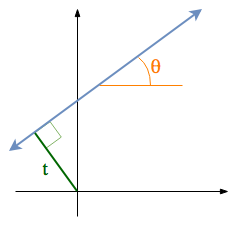 The following diagram shows these parameters for a particular line, with angle denoted \(\theta\) and offset denoted \(t\). As the diagram indicates, \(\theta\) is the angle between the line and the horizontal axis in degrees (0 to 90). The offset parameter \(t\) is the signed distance from the line to the origin, which is positive if the line passes above/left of the origin and negative otherwise. This choice of parameters makes it possible to specify any line of nonnegative slope, including vertical lines. The barcodes are given with respect to an isometric parameterization of the query line that takes zero to be the intersection of the query line with the nonnegative portions of the coordinate axes; there is a unique such intersection point except if the query line is one of the coordinate axes, in which case we take zero to be origin. Furthermore, barcodes are returned as multisets of intervals. For example, in the sample output above, 88.1838 inf x1 indicates a single interval \([88.1838, \infty)\). The options for choosing homology dimensions and coarsening parameters behave exactly as for the computation of the MI file. The next lines specify the bigrades of the generators and relations, via indices for the lists of x- and y-grades. Lists are indexed from 0. Thus, in this example, the row bigrades specified are (7/2,0) and (3,1). NOTE: Currently, one cannot print the Hilbert function and bigraded Betti numbers of a module separately. Nor can one print the minimal presentation, Betti numbers, and Hilbert Function together. This will change soon. The first few lines give lists of possible x- and y-grades of non-zero Betti numbers. This defines a finite grid \(G\in \mathbb R^2\). The remaining lines specify the points where the Betti numbers are non-zero, along with the value of the Betti number at that point. (0th, 1st, and 2nd Betti numbers are handled separately.) Again, for each such point, a triple (x-index, y-index, value) is printed. The visualizations performed by rivet_GUI require an MI file as input. This can be computed by an explicit call to rivet_console and then opened in rivet_GUI. Alternatively, rivet_GUI can call rivet_console directly to compute the MI file. When the user runs rivet_GUI, a window opens which allows the user to select a file. This file can be either an input data file in one of the input formats described in the Input Data section of this documentation, or a MI file. If an input data file is selected, then (unless the file is of type firep) the user must choose the homology degree: RIVET currently handles one homology degree at a time. The x-bins and y-bins parameters for the call to rivet_console must also be seleced. After the user clicks the compute button, the MI file is computed via a call to rivet_console and the visualization is started. (Note that once the Hilbert Function and Betti numbers are shown in the visualization, it may take a significant amount of additional time to prepare the interactive visualization of the barcodes of 1-D slices.) Using the file menu in the GUI, the user may save an MI file. If an MI file is selected in the file dialogue window, the data in the file is loaded immediately into the RIVET visualization, and the visualization begins. The RIVET visualization itself is explained in the section “The RIVET Visualization”. © Copyright 2018, The RIVET Developers Revision 41ba4255.